There are no documentary sources about the origin of the seal. The stamp is in the British Museum in London, the oldest known imprint with the other faculty seals on the document of 24 December 1425. How the stamp arrived in London could not be determined. It is assumed that it was purchased for the B. M. at an art auction in the last third of the 19th century. The seal will have already been present in 1393, since in the statutes of the medical faculty of 24 March 1393 (in the Düsseldorf State Archives), in addition to the large university seal, 4 faculty seals were attached, because this document shows 5 seal incisions. The statutes of the faculty of law, which are only available in copies, show that the faculty seals were attached to the confirmation in 1398. "Sigillum facultatum utriusq[ue] - iuris studii colonien[sis]. The centre of the seal is raised by a raised edge and within this by a raised Gothic four-pass. 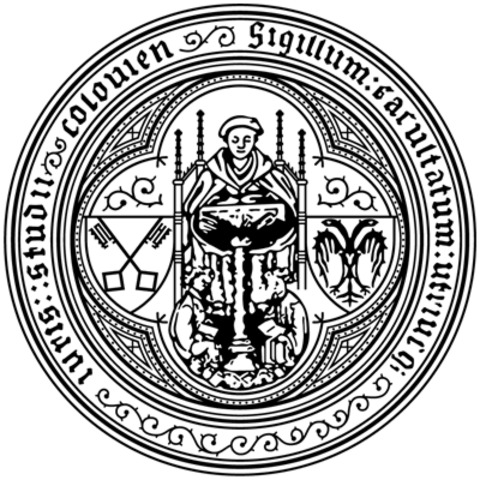 Objectively, the seal contains a representation of teaching, a teaching scene in which a professor sits on a raised Gothic chair decorated with 4 pinnacles behind a lectern resting on a column, with a wide gown and turned forward without a biret. There is nothing to suggest that he was a monk. At his feet sit facing each other, two young students, each with an open book lying on their knees in front of them. I pointed out that this object was taken from the Parisian university seal during the examination of the great university seal and can add that the seal of the Paris law faculty also corresponded to it. The upper part shows the Virgin with the Child Jesus in bust, below a teacher who instructs 2 pupils. 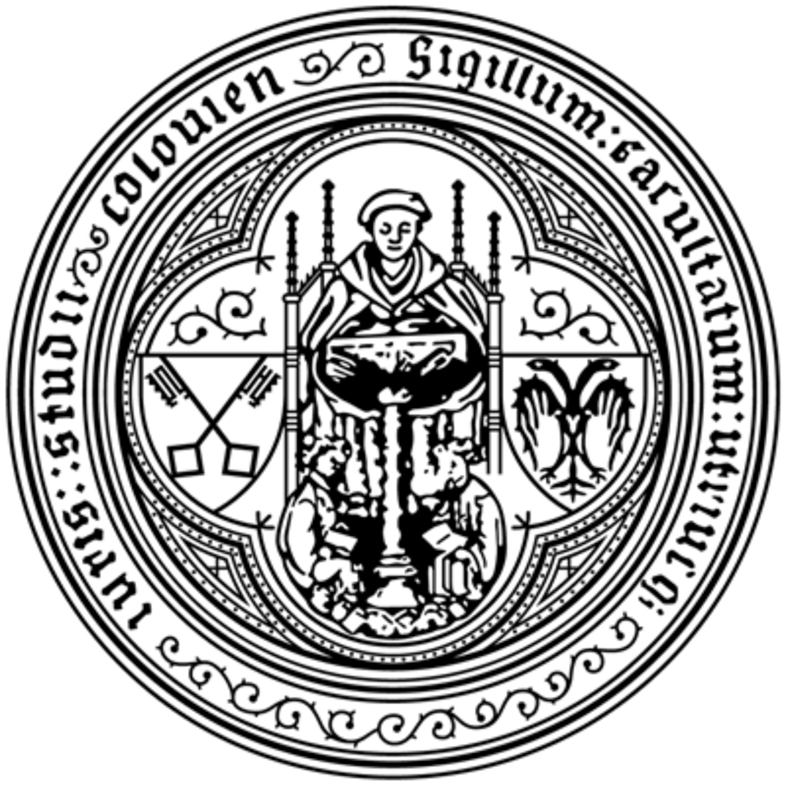 Therefore the inscription: "..collegii magrorum (in) decretis," on the back seal a sitting doctor reading in a beech lying on a desk, with the inscription: "Parvum sigillum Facultatis decretorum parisiensis". The teaching scene has been used several times for sealing purposes in the exits of the 14th century. I refer to the oldest stamp of the University of Vienna from 1365, already used in 1366, which contains a similar teaching scene of a professor sitting on the right with seven students, while a second stamp from 1384/95 in the lower part contains the teaching scene twice (as in Paris), on the stamp of Phil. Fakultät Wien (from the 14th century), which contains a college with 9 students, and the University of Leipzig, which, apart from the Madonna, shows a teaching scene in the lower part, on the stamp of the Phil. Faculty (ex parte Reformatorum) of Heidelberg (a professor with 2 students sitting under him, each with a book in front of them). How much the teaching scene was customary can also be seen from the miniature on the title page of the statues of the theol. faculty of the old University of Cologne in the faculty book, which is located in the Prussian State Library in Berlin, but whose drawing unfortunately suffered a little at the place of the scene, because the book was used when swearing on the statutes of the faculty and the swear had to lay his hand on this place. The seal of jurisprudence finally shows two triangular shields in the lateral four-pass rooms, in the right 2 crossed keys, in the left the double eagle, symbolizing the symbols of papal and imperial power, thus the two rights taught by the faculty, canonical and civil law. This representation, too, often returns in the sealology of that time, as in the seal of the jurist. The seal of the Faculty of Law of Basel contains the figures of the Pope and the Emperor (with the symbols key and sword) themselves, while the seal of Mainz depicts the tiara with the crossed keys underneath and the imperial crown of the temple. Similar to Innsbruck (Oenipontana), but from later times. One also encounters the opinion that in the Cologne seal the professor should introduce St. Ivo, the patron saint of the jurists. I cannot agree with this, for once the depicted teacher lacks the nimbus which would hardly be missing in the saint, then Ivo studied law in his youth, but he never was a teacher of law, but an administrator of the poor and orphans, and thus became the patron saint of the lawyers. On the artistic side, the seal of jurisprudence deserves special esteem. 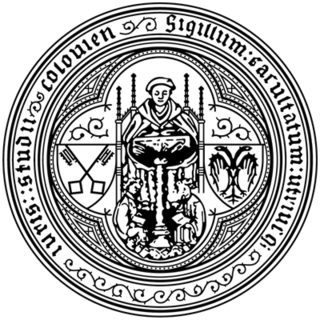 It shows a fineness in the spatial distribution and the execution of the persons, as it is observed next to the Rectorate Seal of 1485 neither in Cologne nor at other universities again. *Excerpt from: "Die Rektorats- und Fakultätssiegel der alten Universität Köln" (The Rectorate and Faculty Seals of the Old University of Cologne), in: Jahrbuch des Kölnischen Geschichtsvereins 17 (1935), p. 16 ff., Cologne 1935, by Dr. Hubert Graven, former President of the Senate of the Higher Regional Court of Cologne and Honorary Professor at the University of Cologne.